Designed to bring comfort and style to outdoor dining, Café Outdoor products combine lightweight durability with weatherproof, carefree maintenance. Stackable armchairs and a variety of table sizes maximize portability and storage efficiency for continued ease in outdoor patio management. 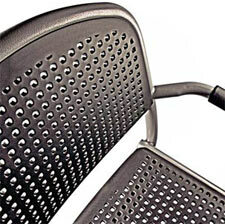 Chair frames are made with one-inch diameter, non-rusting, powder-coated aluminum tubing. Inserts are composed of polypropylene plastic enhanced with anti-oxidant and UV-inhibiting additives. Table frames are made with one-inch diameter, non-rusting, powder-coated aluminum and stainless steel tubing. Square tabletops are powder-coated aluminum. 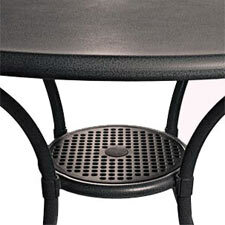 Round tabletops are available in both solid powder-coated aluminum and tempered glass. 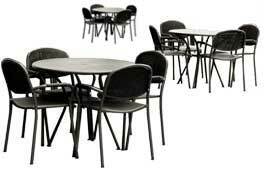 Larger tables in both glass and metal have standard umbrella holes. Café Outdoor products have been tested to meet or exceed BIFMA (Business and Institutional Furniture Manufacturers Association) standards. Customers include single sites and multiple franchise locations across the country. Most products are in stock and can ship next business day.